An unbeatable, pocket-sized guide to Lisbon, packed with insider tips and ideas, colour maps, top 10 lists, and a laminated pull-out map - all designed to help you see the very best of Lisbon. Discover international masterpieces at the Museu Calouste Gulbenkian, take a quaint tram ride through intricately tiled streets, enjoy a vibrant nightlife in Cais do Sodre, or head to Sintra to explore dazzling palaces and ample greenery. From Top 10 churches and monasteries to the Top 10 beaches - this easy-to-use travel guide is packed with information to help you discover the very best of Lisbon. Staying for longer and looking for a comprehensive guide to the region? 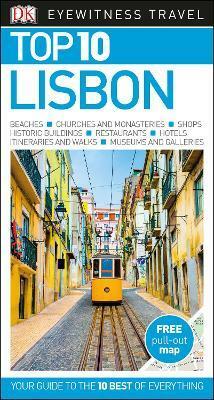 Try our DK Eyewitness Travel Guide Lisbon for more in-depth information.